This evening I found three leaves with white, somewhat cottony circles about the size of a dime on one of the newly potted up tomato plants. Wondering if anything was underneath the cottony stuff I carefully brushed it off to find very tiny eggs neatly lined up underneath. Does anyone have an idea what these are? 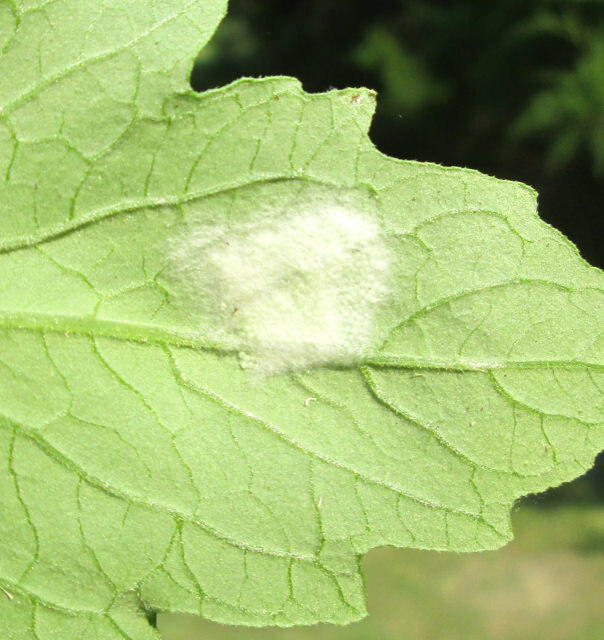 A close inspection revealed a fourth affected leaf on that plant but none on it's two neighboring plants. I have put the leaves with the eggs in a small jar to see what emerges. Very curious. I can't say that I've ever seen such as that. Hopefully, someone here has some insight.... keep us posted! That's real close except for the color. I'll watch for a color change. This tomato is right next to a pot of tall zinnias that butterflies visit every day. I wonder if they're butterfly eggs. 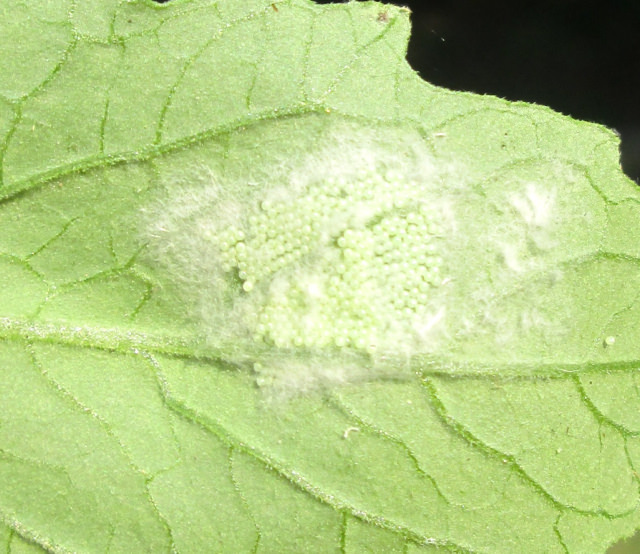 Just by the pattern, I have seen hexagonal pattern eggs like that turn out to be shield bug/stink bug eggs. Can't say I have seen the web over top, though. EDIT just btw we also get wheel bug eggs on the pear tree that are a hex pattern, and they are good predators. But they have distinct colors like a little brown bullseye in each and those are definitely not wheel bug eggs. Last edited by JRinPA; August 15, 2018 at 09:18 AM. That's what I thought at first, but these are too small, plus the webbing is not stink/shield/leaf footed. I'd guess caterpillars, but I really don't know. The local college's entomology dept. is having an open house this weekend, so if you haven't gotten an ID yet (and if I remember to bring the photos), I can ask someone. At the last open house, my partner was reluctant to go at first, but so thoroughly enjoyed it that we stayed the whole 3 hours! We asked lots of questions!! Yes, these are way smaller. So tiny. I've found stink bugs half hatched before (some hatched some not yet) and the eggs are larger. And this is the first time I've found that webbing over the mass. All three masses were a circle about the size of a dime. Today I checked the jar and the cottony areas were getting ragged and had the tiniest black dots all over them. Using a magnifying glass I could just barely detect motion so it's not mold. Possibly worm-like but still too small to see clearly. However I can tell they're starting to munch on the leaves. Masses of tiny moving dots devoured the three tomato leaves they were laid on so I stuffed a couple more leaves in the jar. They grew enough, about 1/8" long, to tell they were some kind of caterpillar, at least at this early stage. Whatever they were they are now dead. I forgot about them for a couple of days and then I opened the jar nothing was moving. It was a real mess in that jar with excretions,etc and out it went. I haven't found any more out on the tomato plants, thank goodness.